Note: we are shut on February 1st 2019 no Telegram can be sent. 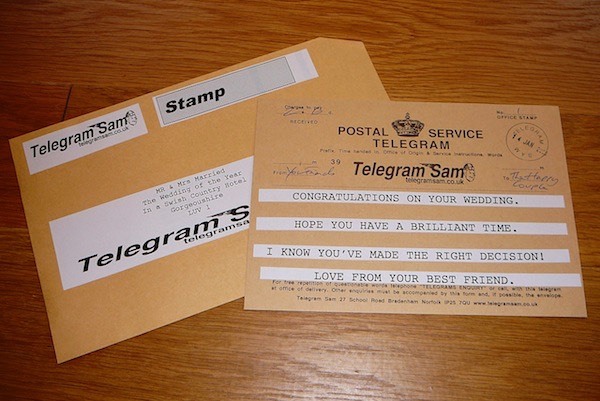 Remember Telegrams? They have a romance and individuality which is distinct from the traditional greetings card. For many years the telegram was the quickest and most personal way of sending a greeting, or message. It is again, thanks to Telegram Sam. We send by first class post or guaranteed next day delivery. Telegram Sam cards are appropriate for Birthdays, Anniversaries, Marriages, Get Wells, in fact any occasion which requires a uniquely personal message including a simple Well Done, or I Love You. The design is based on a pre war format. Originally Telegrams were printed onto buff paper, but we believe it is better to use a durable heavy card so that it can be displayed more effectively. It does not open up like a traditional card, but it means your message can be seen at all times. The Telegram is sent in a unique buff brown envelope We will print it onto self adhesive paper cut and stick it on a Telegram, then date stamp and first class post or next day deliver it to the intended recipient (or to you in a plain envelope with the special envelope inside). THIS IS A POSTAL SERVICE. We’ve been sending Telegrams since 1991 so you can trust us to get it right.